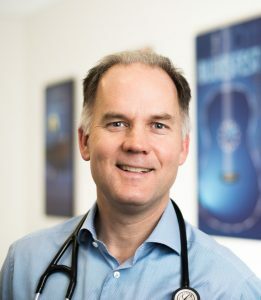 Dr. David Millar brings a breadth of life and medical experience to the practice, as well as a deep knowledge of Ottawa and obstetrics. A Glebe graduate, David grew up in Ottawa, leaving home to study politics and economics at the University of Toronto. During his undergraduate years and after obtaining his BA, he worked at a variety of jobs including house painter, cattle rancher, cowboy (every lad’s dream at one time or another), and cash manager and foreign exchange trader at Export Development Canada. Serves as Executive Director and Medical Lead for the new Monarch Centre, an innovative postpartum care model that provides medical care and lactation support to newborns and mothers. David is married and has three adult daughters. He loves to run, cycle, and play guitar (some days he wishes he were a rock star instead of a doctor – if only he had talent!). But in all seriousness, he is one of the lucky people who goes to work with a smile on his face and is still smiling when he comes home at night.